Want to keep an eye on your e-mail without juggling windows just to fit Mail on your display? 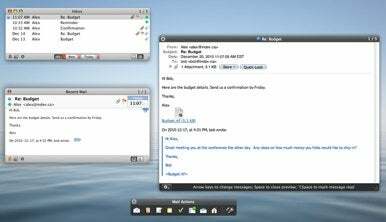 Indev on Thursday released Mail Perspectives, the feature-packed successor to its popular MiniMail plugin for Mail. Mail Perspectives lets you take a different look at your e-mail by shrinking Mail’s interface and sprinkling in some useful customization. It distills Mail’s large, comparatively sprawling window into a resizable box containing just the essentials, like a list of e-mail subjects, along with filters to view all messages, just unread messages, or just those from a certain day. You can adjust this list to show messages from multiple mailboxes and even other folders, giving you a comprehensive, yet compact glance at all of the e-mail that matters. Messages can be viewed with Quick Look or opened in a separate window, and you can still use all of Mail’s standard keyboard shortcuts for actions like replying, deleting, and forwarding. If you prefer clickable icons, you can also display a small Mail Actions Window with buttons for most common features, including creating new messages, notes, and tasks. Instead of a message list, Mail Perspectives can optionally display a preview of each message and allow you to flip through e-mails with arrow keys. Other quick access options let you turn off new e-mail alerts or pin Mail on top of all other windows to avoid obstruction. Part of Mail Perspectives’s power is that you can open multiple windows and customize them to display different mailboxes and even different views; one, for example, could display a list of e-mail subjects, while another can display individual message previews. Mail Perspectives essentially replaces Indev’s MiniMail 2.0 plugin, which offered a smaller subset of these features. Despite the difference in product names, fans of MiniMail can view Mail Perspectives as a major 3.0 or even 4.0 upgrade. Plus, Indev is offering a free upgrade to Mail Perspectives to owners of MiniMail 2.x. For curious new users, Mail Perspectives has a free demo available, and it requires Mac OS X 10.6 Snow Leopard. Licenses are available now for a discounted price of $20. After March 18, that price rises to $25.